Last year for back to school, we discussed school bus and driving safety tips. This year we tackle backpack safety. In the coming days we will see many students headed back to school using backpacks to carry their computer, books, lunch, and other belongings; however, how many are carrying packs that are too heavy? Good backpacks are designed to distribute the weight of the load among some of the body's strongest muscles. 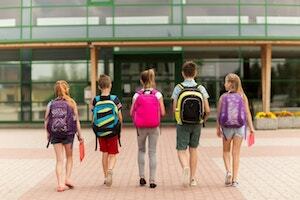 When used incorrectly, backpacks can cause neck, back, shoulder, hip, and knee injuries. Overloaded or improperly worn backpacks can cause imbalance allowing a child to potentially slip and fall and backpacks or rollers left on the floor are major tripping hazard. According to the U.S. Consumer Product Safety Commission, backpack-related injuries send an estimated 7,000 children a year to emergency rooms. More than 14,000 children are treated annually for injuries. Some additional points to note are that heavier items should be placed closer to the back of the backpack, near the body. Children should always use both straps, not swinging on to one side of the body. Students should also properly pick up the backpack by bending at the knees and using both hands to lift and place on their shoulders. While some parents resort to roller bags, they too present their own safety risks. Parents are encouraged to monitor their child’s backpack weight. Help your child determine proper fit, property usage, and what is necessary to carry. If it's not essential, leave it at home or keep in their locker. Help make it a great and safe school year.